Happy Pie Day all! Since I was a child, I have called the Wednesday before Thanksgiving "Pie Day" because on that day I would bake pumpkin pie with my mom. And my mom is one of these Italian ladies who are a slam dunk in the kitchen. It was very fun. Always a relaxing day home with family. And so today is a nice day for reflection, no? 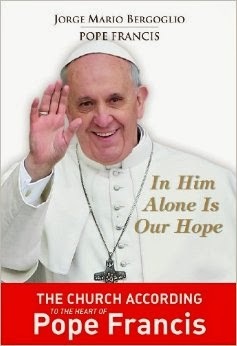 November's selection for the Catholic Book Club is In Him Alone Is Our Hope: The Church According to the Heart of Pope Francis. It is a retreat prepared by then Cardinal Jorge Bergoglio for a group of bishops, meditating upon the Spiritual Exercises of St. Ignatius Loyola and what that means to their ministry. This book was announced *very* shortly after Pope Francis' election to the papacy, in the frenzy that followed the Conclave. I ordered a copy fairly early on, in my curiosity about our new pope. The printing took a lot longer than anticipated, and so I haven't had the book for very long. Since it was designed as a retreat, I thought it would make a nice lead up to Advent. And indeed, it is lovely. Our pope has a beautiful and caring way with words, a true shepherd. It's not a very long book at only 135 pages, and there are a lot of bolded subtitles to make navigating the text easier. He has some powerful things to say about faith and hope and how we should never despair when we are truly listening for God's voice. Carrying life's crosses is certainly a theme common to people in all vocations. I will say though that I wasn't able to apply everything that he said to his brother bishops to myself as a laywoman. I'm not 100% certain that all readers would have the same opinion, but that was my experience. It doesn't lessen the beauty of what he had to say, but in terms of spiritual reading, I have an easier time taking things away from books that I strongly relate to. I certainly have a lot underlined in this book, and pages turned down, so returning to it and reviewing those passages will bear fruit in the future. Thus, book is like a reference source for me, which is a good thing! It's always difficult for me to get through deeper spiritual reading, but it's good for me, like eating vegetables. :) I would put this book into that category. I couldn't just read it while both kids were whining and/or trying to get my attention in the background. Watching Regular Show with them while Muscle Man whips his shirt around... All not possible when reading this book. It required more concentration. And we all need reading like that sometimes. I do have some other books about Pope Francis that I received when I attended the Catholic New Media Conference, so I'm sure that at some point I will add those to our book club list. So! Next month we have A Catholic Christmas, by Kathleen Carroll. VERY excited about this one! I also have a Christmas-themed Amish fiction title on its way to me from Image Books that I will review on here when I finish as well. Lots of good reading to look forward to! You won't see any posts from me until Monday, since I'll be on blogging hiatus for the holiday at home with my family. *But* on Monday there will a Thanksgiving weekend update, I'm certain, as well as the official kickoff to the 2013 Advent Veiling linkup! If you decide to experiment with wearing a headcovering to Mass for Advent, link up your blog! The linkup will stay open until Christmas, so you'll have plenty of time to post. It's going to be fun. See you Monday!